The Heritage Golf course resides on an old historic plantation in South Carolina, just south of Myrtle Beach in Pawleys Island. This Dan Maples design has a classic feel with natural surrounding landscapes that create the charm of the old south. This Heritage golf course consists of fresh water lakes and century-old live oak trees. 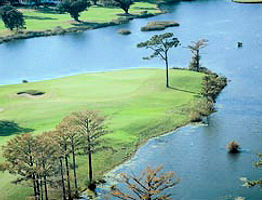 The 18-hole golf course gives the impression of an island golf resort. The rolling greens and open fairways compliment this plantation style course. Plenty of water hazards and bunkers offer enough challenges to interest both the avid and beginner golfer. A colorful array of azaleas, crepe myrtle, and camellias are the backdrop that brings this southern course beauty to life. The Heritage Golf Course has a clubhouse that reflects true southern charm with manicured and maintained greens year round. Heritage ranks #14 out of #20 “Top Golf Courses By Region” to play along the Grand Strand by the South Carolina Golf Course Ratings Panel in 2012. Hot tubs golf tennis swimming they have a great selection here at the club. A hidden gem of a golf course. Absolutely beautiful and a great round of golf a wait a skilled golfer. The clubhouse is beautiful and the people who work there are just great. Be careful of the course marshall, they're about 10 ft long and have big mouths. ???? The Heritage Golf course resides on an old historic plantation in South Carolina, just south of Myrtle Beach in Pawleys Island.